I confess that I lost all of my sparkle this week. On Tuesday I wanted nothing more than to pull a blanket over myself and lose myself in a book. My back hurt from top to bottom, my list seemed endless, and I did not want to go to work. All I wanted was one full day at home, and that wasn't going to happen. However, my sparkle is back. Two nights of wonderful sleep and lots of ticks on my list have me once again eagerly anticipating Christmas. Tomorrow is a half day of school. My Spanish 12 class is doing a rendition of Feliz Navidad for the school assembly that should be fun. The paper whites wanted a closer look at the Advent calendar and leaned right in, as if to speak to the angel. Now, about Christmas gifts. If ANYONE who will be at our house on December 24th is reading this post (I don't think they will, but just in case...) GO AWAY. You don't want to spoil any surprises, now do you? Friends of ours do handmade gifts for each other and last Christmas I thought it would be a fun idea to try. Our children were all on board, some more enthusiastically than others, but we gave it a whirl. We all spoke of being done by summer. HA! For our daughters and daughter-in-law, I made silk kimono toppers - like loose cardigans - lightweight. There are four there, because the dark pink one is a prototype. I sewed French seams and hand-rolled the hems, which took much longer than I anticipated. I'm quite pleased with the results and I hope the girls like them, too. For the guys, Tim made wooden serving boards and he smoked salmon. They'll also each get a loaf of homemade rye bread, some spiced nuts, and other goodies. For the grands, I made flannel rag quilts. They came together quickly and I used up a lot of stash fabric. Tim made marshmallow shooters for them from PVC pipe and fittings. This evening, before wrapping them, we had a marshmallow shoot out in the kitchen. The shooters really work! There were marshmallows flying everywhere (the mini ones) and we were laughing so hard we could hardly blow the shooters. I hope the grands enjoy them as much as we did. We've had some crazy windstorms lately. Rain pelts against the windows and the house rattles with the wind. Many people lost power. Although our lights flickered seriously, we still have electricity. I came home this afternoon, turned on the tree lights, and made a cup of tea. So comforting. Then I wrapped gifts. They are all done. About that endless list I mentioned. Quite a number of things were crossed out - deemed unimportant in the grand scheme of things. Permission granted to relax and enjoy rather than power through. Dinner tonight was a simple frittata with leftover ratatouille and cubes of ham, along with a salad. Easy peasy. Tomorrow the grands are spending the night here. We're planning a cozy time together. It feels good to have a little sparkle back. How are you doing? You make beautiful things. I lost my sparkle after Thanksgiving and am still depressed. Should get better on Christmas Eve. I go through this almost every year. Lovely post. The shoot out makes me laugh. I love the tea cup pattern. My sparkle is a satin finish contentment for a slow holiday season while looking forward to January and longer daylight. The sparkle around here for both of us is building. Yesterday we went to the Farmer's Market to get homemade cabbage rolls (for Christmas Day) and Tourtiere (for Christmas Eve). We were both grinning when we got back. Oh, and we found a couple of trays of yummy homemade Christmas baking to add to the sweet treat tray. I love your mantelpiece ... it certainly sparkles! Wishing you a Happy Christmas, Lorrie! Dear Lorrie - it is no wonder you lost your sparkle, what with teaching and making so many beautiful things. Love the silk kimono toppers, especially the two at the bottom of the collage. My youngest son spent his last day teaching yesterday, and arrived home to discover that his MiL had been rushed off to hospital, and is seriously ill. Today instead of preparing for Christmas the family now have a very long journey to make. Sometimes this season is stressful for so many people, but I am pleased to know that you have your sparkle back. Nothing like shooting marshmallows to get the sparkle back! All the gifts sound amazing and the kimonos are beautiful. Of course, the girls will like them! Wow, you have made some amazing gifts. Well done you! I am so glad you got your sparkle back. It can be over whelming this time of year. SO much preparation for one day. Have a lovely Christmas and thank you for stopping by my blog this week. A good night's sleep usually helps to bring back the sparkle. As to back pain I know what you mean: I have suffered it for a few days but now getting better - shall be cured for Christmas... You have made amazing kimono toppers for the young ladies. Gorgeous and all the other gifts too. No home made gifts here. Your tea cup with the Christmas tree is a cozy sight. Wishing you and your family a great Christmas time. You should be worried now that we will ALL show up at your door on Christmas eve! heehee! What wonderful gifts. I think the snuggly throws are my favorite....is there a Nana size one in there? Have a wonderful weekend ahead! And yes....it's rainy here right now and harder to sparkle! Holiday hugs! 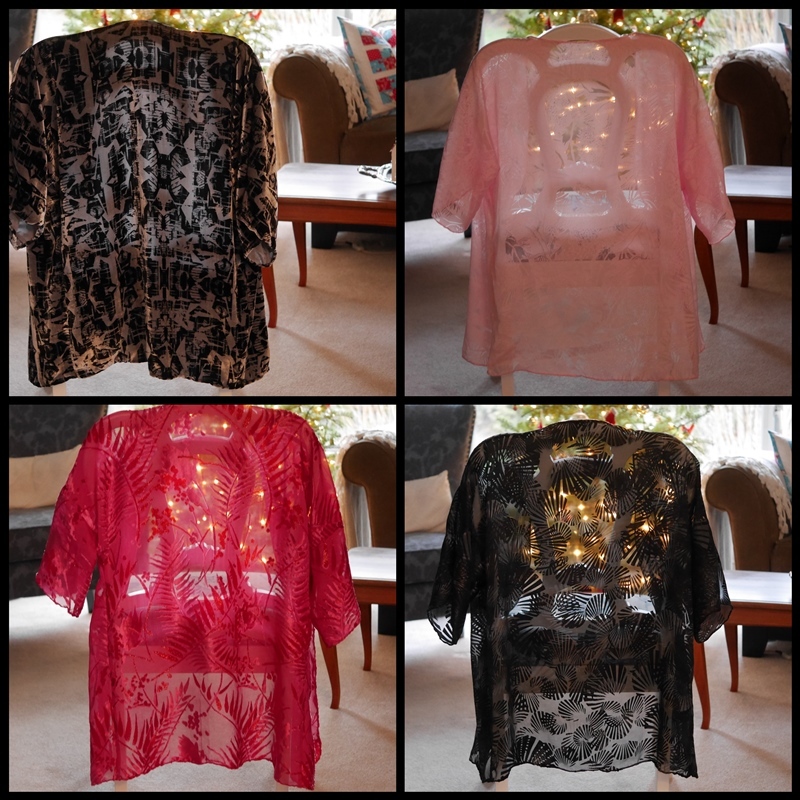 The girls should be thrilled with the pretty kimono tops, they look very chic. I have made a few patchworky things for friends . Now all is wrapped and finished and like you, I can settle down with a cup of tea! Your sparkle is shining brightly through those gorgeous kimonos. Oh my, what beautiful and thoughtful gifts you and your hubby have come up with. Would love to be a fly on the wall when the grands open the marshmallow shooters. What fun! Around here we are experiencing days of gloom. It is doing it's best to dull my sparkle. Today I woke up and decided to blow a big huge raspberry at the weather. The tree is lit, the candles are burning, the carols are playing and I simply refuse to let the daytime darkness steal my joy. Your post today and so many others are helping to keep things sparkling. Merry Christmas to you and your family, Lorrie. I love what you've made for your gifts for your family! Just think of the fun you'll all have with the marshmallow shooters! Glad your Sparkle is back, and you are ready to enjoy the season! Wow . Lovely gifts. The marshmallow shooters sound very very fun! Tomorrow we clean a bit and take out the Christmas china. Today we finished the grocery shopping. Diagnosis of a serious illness in our extended family has robbed some of the sparkle this year. Oh, but His name is EMMANUEL! "God with us." Amazing!! It is what we need to carry on amid the pain and the struggle of this life. What a fabulous idea of making homemade gifts, Lorrie! The kimonos for the girls are beautifully made, and the rag quilts will be cozy and loved by the grands. I'm sure the serving boards and smoked salmon will be greatly appreciated. Those marshmallow shooters sound like such fun. We all need a bit of fun in our lives. I can see that they added to your sparkle. Enjoy your vacation! Glad that you bounced back so quickly. I'm sure that your family will be thrilled with your awesome homemade gifts. My vacation also started today. I'm off for almost 2 weeks. Woo-Hoo! Merry Christmas! So glad to hear you got your sparkle back. Those are some amazing gifts you made and what hubby made sounds great, too. I'm sure everyone will love them. By now you are off until after the New Year? Enjoy your break. A very Merry Christmas to you and yours! You are amazing. I would love to own one of your silk kimono toppers. What a great and original idea. They are truly beautiful. I love to read about your family and how you all are so close. Have a most wonderful Christmas. Wishing you and yours all the Best that life has to offer. Sleep does wonders. It even helps in weightloss as it is a great metabolism booster. The hand-made gifts for your family are wonderful, and I'm sure will be greatly appreciated by all recipients. I had a day like that too - where everything seemed overwhelming and I actually cried! It seemed like all the stuff that I wanted to do or thought was expected of me rolled into one big ball and I could not untangle it. But I'm glad to say, I recovered. Shopping, baking, playing with grands ... it all came together. .. one day at a time. Sometimes I find out that if I am just available for small things here and there ... it all works out and it's not hard at all. Your gift giving sounds wonderful. It will be a special Christmas. We all have days like those, but glad you pulled through with sparkle! Your gifts look absolutely fabulous, and there's lots of fun in there too, like the marshmallow shooters. I can JUST imagine you having a shooter fight in the kitchen. LOL. I am great - our daughter arrived today and we are now complete. I hope you have a wonderful Christmas! Always amazing to me what a good nights sleep will do! ....The handmade gift exchange is such a wonderful idea and Lucky are the kids and grands who have such a talented mom/grandmother. The gift for the guys sounds wonderful too and is the only thing anyone in this family of two could replicate for our offspring (Great Grandpa here has all the talent]. Merry Christmas to all! And happy vacation! You can't beat a good nights sleep, or two, for helping you feel more energised. I think your gifts look fabulous and I'm sure they will be most happily received. Wishing you and your family a Merry Christmas and all good things for 2019. Your handmade gifts are gorgeous, Lorrie, I'm sure that they were a great hit. I hope you all had a wonderful Christmas day.